We now seem set to see millions on strike on 10 July . This meeting is to bring together and support those on strike national and locally including council workers, health workers, teachers, firefighters, civil servants, SOAS. EDF, TFL British Museum company and more. 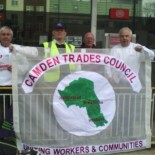 This entry was posted on May 24, 2014 by CAMDEN TRADES COUNCIL.